Travelling to Pandan Island is an adventure in itself. Whether you choose to come by seaplane, by airplane and boat via San Jose or decide to take the overland route via Abra de Ilog, you will probably travel like never before in your life. 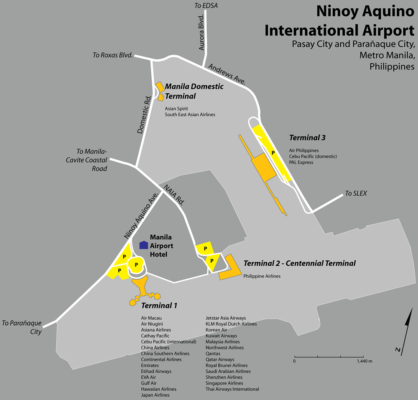 There is presently one airline serving San Jose airport in Mindoro Occidental. As the schedules can change without notice your are strongly adviced to check with your travelagent or with the airline directly. Then to Pandan Island by prearranged transfer or public bus/jeepney via Sablayan. Once in Sabalayan just take a tricycle to bring you to ‘Punta in front of Ludi ‘s place’, our Bangka (outtrigger boat)is waiting there , price is 200 pesos for 1 person + 50 p for each additional person and an additonal of 50 pesos in night time. Ceres Bus offers daily, air-conditioned bus trips from Cubao, Quezon City, Metro Manila and Pasay City Terminal. The fare is around Php 900 per person, one way and the journey takes between 8 – 10 hours, depending upon the ferry schedule and traffic conditions. Note: As the schedules for the buses changes frequently make sure you check with your travel agent or the Passenger Terminal before departure! The departure times are for reference only! In Abra there are buses waiting to bring you to Sablayan. Once in Sabalayan just take a tricycle to bring you to ‘Punta in front of Ludi ‘s place’, our Bangka (outtrigger boat)is waiting there , price is 200 pesos for 1 person + 50 p for each additional person and an additonal of 50 pesos in night time. In Abra there are buses waiting to bring you to Sablayan. If you are looking for more luxury the Days Hotel is the place to go. or by Chartered Banca (local outtrigger boat) to Abra de Ilog, approx. 25.- US$, duration 1.5 hrs. From Abra de Ilog bus or jeepney to Sablayan. Caticlan (Panay) to Roxas (Mindoro Oriental) several trips daily and then public van from Roxas to San Jose (4 to 5 hours). Then to Pandan Island by prearranged transfer or public bus/jeepney via Sablayan. From Sablayan there are watertaxis available to bring you to Pandan Island. Note: As the schedules for the ferry changes frequently make sure you check with your travel agent or the Passenger Terminal before departure. Caticlan (Panay) to Bulalacao (Mindoro Oriental) 2 trips daily. From Bulalacao pier public van/bus to San Jose (~2 hours). Then to Sablayan by prearranged transfer or public bus/van. From Sablayan there are watertaxis available to bring you to Pandan Island. 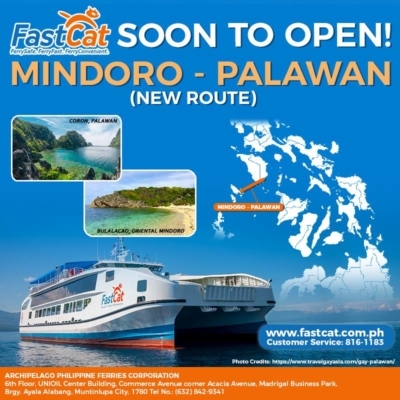 Note: As the schedules for ferries change frequently, better check with the Passenger Terminal or FAST CAT CUSTOMER SERVICE HOTLINE: (632) 816 – 1183 before departure. Tricycle to Buruanga in Aklan, Panay. Large outrigger boat to San Jose, approx. 20.- US$, departure: irregular, duration 6 to 9 hrs. Then to Pandan Island by prearranged transfer or public bus/jeepney via Sablayan. At the bus stop in Sablayan just take a tricycle to bring you to ‘Punta in front of Ludi ‘s place’, our bangka (outrigger boat) is waiting there if you prearranged a trip with us. You may also contact the boatman , his name is Dondon directly his mobile phone number is +63 926 503 54 64. The price is 200 pesos for 1 person + 50 p for each additional person and an additional of 50 pesos in night time. The maximum capacity of the bangka is 10 passengers. The normal operation hours are from 6 am to 9 pm. Pandan Island on the West coast of Mindoro is a good day sail or, more likely, an overnighter from Puerto Galera. Pandan Island is a small, private, eco-tourism resort with 22 bungalows/rooms and a dive center; the rest of the island is uninhabited. Electric power is supplied by solar panels totalling 5kW charging a 48V battery-bank. 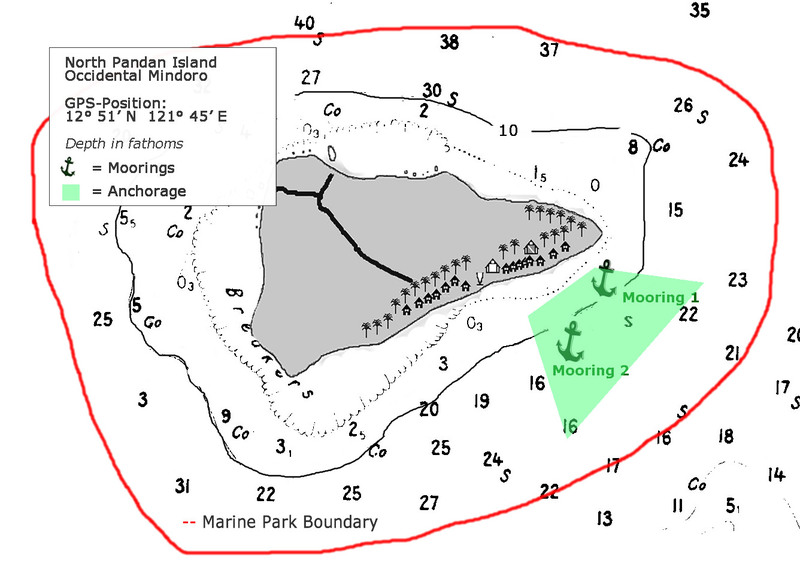 Apart from a designated mooring/anchorage area the whole reef around the island is a protected marine park. So it is absolutely forbidden to drop anchors on/near the reef or isolated coral blocks from about E, throughout N, W until S of Pandan !! you are responsible for your dragging anchor-chain in shifting winds. Also, no fishing unless 300 meters or further offshore! These laws are strictly implemented. Pandan Island is the gateway to Apo Reef. For cruising yachts from Puerto Galera en route to Coron-Busuanga, it is the perfect midpoint, being 90 NM from Puerto Galera Yacht Club and 70 NM from Coron town. Please contact us on VHF channel 10 (156’500) if the boats are due to return late afternoon or the mooring is available. 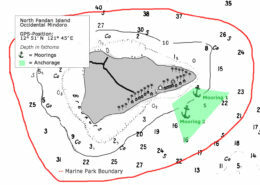 Pandan Island offers fairly good anchorage for all sizes of vessels SE to S of the beach, in fair and medium weather conditions. For vessels with less than 2 metre draft there is a plateau, a sandy area 3-5 metres deep, between and slightly SE of above mentioned moorings. vessels with more draft need to anchor further offshore in about 22-30 metres of water (good holding in sand/mud). N.B. Avoid dropping your anchor between the two areas as the steep slope may cause your anchor to drag in NE winds. The resort boasts a european/filipino restaurant with buffet-style dining at dinner, especially fresh fish, seasonal fruit and vegetables. Short order spaghettis, burgers, sandwiches, soups, milk-shakes or salads are also available. At the dive shop you can have your scuba-tanks filled and rent dive-equipment. Depending on how busy we are, we may also be able to help you with small repairs, including welding. Need a day in a bed that does not move with the waves? The resort offers family houses, standard bungalows and budget rooms. As an eco-tourism resort, all of the electricity needed to run the lights comes from a solar system (12V) installed in each cottage. 5V outlets for charging cell phones can be found in most cottages. More power-demanding gadgets need to be charged at the bar, wi-fi shack or dive-centre. Both Globe and Smart signals are good and there is free Internet in the wi-fi shack. Sports and stuff: volleyball, ocean kayaks, petanque, darts, pool/billiards, ping pong and a babysitter can be arranged. If you panic in the peace and tranquility and just need to know there is a big island nearby, a 1.5 mile banka trip will deliver you to Sablayan town (30,000 inhabitants) from where you can get road transport to the provincial capitol, San Jose, where there are scheduled flights to Manila.